Unfortunately awful presentations are the norm, with swathes of text on-screen, presenters speaking over everyone’s heads, little interaction, no stories, poor images and a bored audience. Why? Most of what you thought you knew about presentations is wrong. Successful presentations are not about speaking but listening. They’re not about your knowledge but the audience’s needs. They’re not about ditching PowerPoint but using it properly. They’re not about overcoming fear when speaking but overcoming caution when preparing. 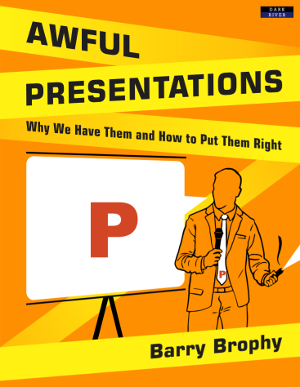 Conversations work whereas presentations (which are essentially the same thing) fail, and this book explains the hidden mental habits which lead presenters to misuse their already-perfected speaking skills when presenting. 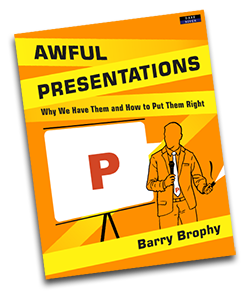 With over 70 colour images, diagrams and sample slides, Awful Presentations is elegant and insightful, and the first original book on this topic in decades. Click here or on the image above to view details and order direct. 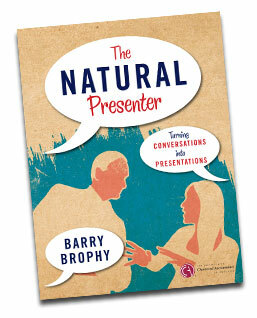 My first book, ‘The Natural Presenter – Turning Conversations into Presentations’ can be ordered through the link below. It is a comprehensive presentation guide on how to prepare and deliver a clear and engaging presentation. It explains the psychology of memory, comprehension and communication on which presentations function. It also has a special section on presenting complex material to a non-expert audience. Structuring material so that it is easy and natural to present. Dealing with nerves, and presenting with conviction. The proper use of visual aids, graphs, pictures. The use of analogies, examples, demonstrations and stories to bridge the gap between speaker and audience. Over 60 photographs and diagrams to demonstrate the points made. Application of principles to all presentation scenarios – lectures, work presentations, even wedding speeches.